How Can I Remove Skin Tags? It can be scary when things go “bump” — especially so when it’s you! If you’re noticing more and more little “bumps” on your eyelids, neck, underarms, groin and/or breast areas, you may have skin tags. Skin tags are extremely common and they come in all shapes and sizes. They will usually start out as very small, fine bumps (only a couple of millimeters), and rarely they can get as big as a centimeter! They are fleshy; you may even be able to grab onto them because they are attached to the skin by a base or “stalk”. Rest assured, they are completely harmless, but we understand that they can be annoying to deal with and ugly to look at. 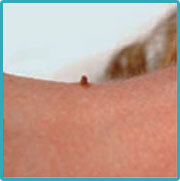 Treatment of skin tags is easy and straightforward. At Celibre Medical Corporation, we use a device called a hyfrecator to treat unwanted skin tags. It uses electrical current to heat the growth, gently yet precisely causing damage to the skin cells of the skin tag. This destroys the skin tag, allowing it to heal and disappear! If you have skin tags and want to get rid of them, we can help you. Give us a call today and get your smooth skin back!